One word summary for the first three books of The Selection series: Feels. 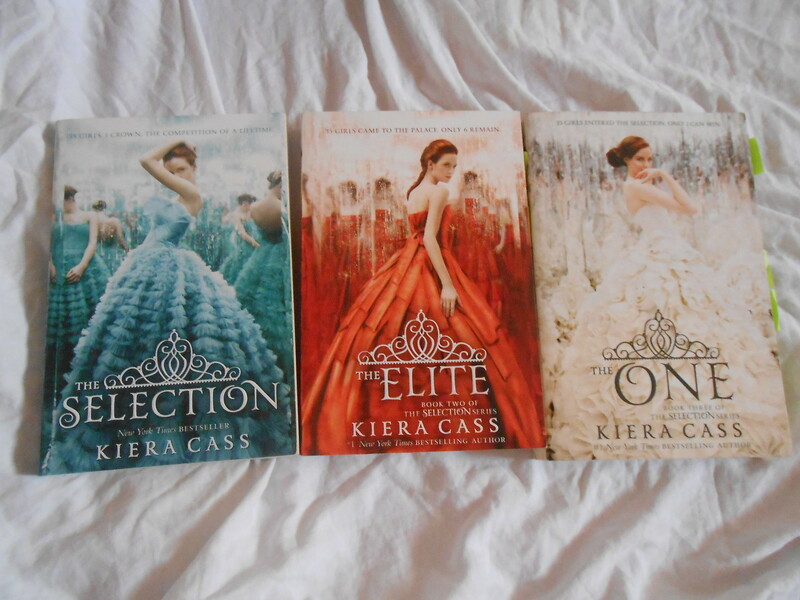 I wasn't really planning on reading them but seeing the covers and the hype on Tumblr, I just had to have them. I bought the books last year but they were just sitting on my shelves waiting to be read. I was already spoiled on who America will end up with. I accidentally saw a spoiler on Tumblr. Thus, I was quite unsure if I should still read them. Thankfully though, National Book Store announced Kiera Cass' book signing event. One big reason for me to finally read them. And thank goodness I did! The Selection is a YA dystopian read. Same elements are in placed (especially in book one) but it was refreshing to read from a different perspective. All of my dystopian reads involved a heroine who can physically put up a fight. And that's good, but it was nice to read about America who can influence other people, who is capable of starting change, and who has a strong character even without using force herself. There were still pieces of action weaved into the story, though. And it added thrill into the story, making me look forward to what will happen next. The pacing is varied. It got a bit slow for some parts. But nevertheless, my reading never got boring and I enjoyed reading almost all scenes. I can't really discuss certain plot threads, because I might spoil those who haven't read the 3 books yet. But in general, I liked how most scenes are relevant and connected to each other, and how the events influenced not only America but also the other characters. There were some though that I don't think necessary in any of the characters' development. Plotwise, The Selection, The Elite and The One are very enjoyable read. I thought they will be very cheesy, quite shallow read, but I was proven wrong. The characters, especially the main ones, are easily relatable. I liked almost all of the secondary characters. I think they are all well-written. And I was able to feel the "right feelings" for each character. Does that make sense? Haha! America Singer started as a cliché protagonist, but like what I've mentioned previously, she diverted from the typical heroines who physically fight. I liked that about her, plus she's talented and has sense of humor. Maxon and Aspen. Aaah! Even though I was already spoiled who America will end up with, and I kind of already set my mind who to like, I still like them both. And any alternative ending would have been okay with me. They can both be stubborn and selfish, but I was able to see their feelings for America, and how also loyal they can be toward their duties. As for the secondary characters, I especially like May, Queen Amberly, America's dad and yes, Celeste. Haha! I liked the author's writing style. Written in a first person perspective and in America's POV, the story is easy to understand and follow, and the flow of events is smooth. Of the three books, I like The One the most. I also liked how I felt torn between Maxon and Aspen. I was anticipating how America will tell the other guy that she chose the other one. Haha! My rating is 1 point short because book one did not really offer something unique. As the story progresses though, there came developments. :) Other reasons for the point deduction include unnecessary scenes/events (in my opinion) and some slow parts in the story.